The land of Terre d'Ange is a place of unsurpassed beauty and grace. It's inhabited by the race that rose from the seed of angels, and they live by one simple rule: Love as thou wilt. Phèdre nó Delaunay was sold into indentured servitude as a child. Her bond was purchased by a nobleman who recognized that she was pricked by Kushiel's dart, chosen to forever experience pain and pleasure as one. Phèdre's path has been strange and dangerous. She has lain with princes and pirate kings, battled a wicked temptress, and saved two nations. Through it all, the devoted swordsman Joscelin has been at her side, following the central precept of the angel Cassiel: Protect and serve. But Phèdre's plans will put his pledge to the test, for she has never forgotten her childhood friend Hyacinthe. She has spent ten long years searching for the key to free him from his eternal indenture to the Master of Straights, a bargain with the gods to save Phèdre and a nation. The search will take Phèdre and Joscelin across the world and down a fabled river to a forgotten land. . . and to a power so intense and mysterious, none dare speak its name. I fell in love with this series years ago with the first book. Jacqueline Carey is incredibly clever and makes a complex, beautiful world loosely based on the cultures from this one. What I love about this series is that it's a mix of adventure, fantasy, philosophy, and romance. Really, you can't lose with this one. I think this is the most gruesome out of the series so far. The previous two had some bad stuff, but nothing like what Phedre endures while enslaved to the sadistic warlord, the Mahrkagir. However, the reader is spared the worst of it and it's nice that the conflict is enhanced with each subsequent novel. The relationship between Joscelin and Phedre is really put to the test, and Phedre's strength of will to carry out her mission is also challenged. These two characters are so extraordinary that they sometimes seem invincible, but Carey makes sure to never take it easy on her characters. She gives them the ultimate challenges, making life difficult for even them. I really love the relationship between Phedre and Joscelin. They fiercely love each other, and it makes me so happy to read about their story. They accept all of each other: the flaws, the strengths, the quirks. I feel like this is how relationships should be. They hardly ever argue because they are always looking at situations through the other person's point of view, and they respect each other to make the right decisions for themselves. I love it. This is what true love is, and this is what a mature, adult relationship should be. This series is unique in that it just dives right into the dark stuff and keeps going. But amid all the death, torture, kidnappings, and slavery, there are so many great lessons and things to think about for real life. 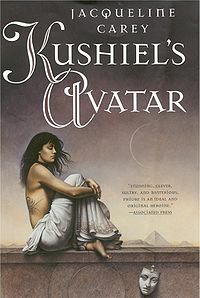 Most of all, what Kushiel's Avatar especially does is show the strength of love. What it is, what people will do for it and because of it, how it tears people apart, brings people together, and how it gives meaning to our lives are all main themes woven through this novel. For that alone, I'd recommend it. However, it also has fantastic writing, an interesting world, brilliant characters, and an entertaining plot. I don't think it's for everyone, because there is a lot of darkness and stuff many may considered "weird," but for those who can take the different culture of the D'Angeline world, you will be enamored of this series. When school lunchroom doors open, hungry students rush in, searching for tables where they wouldn't be outsiders. Of course, in middle school and high school, almost everyone is an outsider: the nerds, the new girls, the band geeks, the loners; even the "popular" cheerleaders. 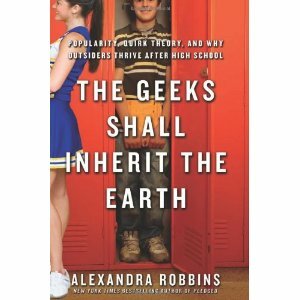 Alexandra Robbins' The Geeks Shall Inherit the Earth takes us inside the hallways of real schools to show us how shifting cliques and permanent marginalization affect children. Following individual students over the course of a year, she tracks the plight and possibilities of self-confessed nerds, freaks, punks, Goths, and weirdos. Her central message is heartening: Our increasingly homogenized society ultimately needs and welcomes the cafeteria fringe. This should be required reading in high schools. I think all teachers and people involved in education should take a look at this too, because changing how teenagers are treated has to start at all levels. It is sad how many teenagers feel lonely and depressed because of who they are and how they feel. What this book does is identify a lot of the problems that causes bullying and exclusion tactics, and I think that if teenagers read stories about how their actions affect others, they would try to be nicer and more accepting of other groups. Now, there aren't any hard statistics of the successes of geeks and outcasts after high school. If you're looking for numbers that prove that high school outcasts make more money and get the best jobs, this isn't what this is about. Instead, Robbins focuses on the traits that make teenagers outcasts in the first place and goes onto describe how these same traits will serve them better in a job or in adult life. I really liked the setup of this book. Instead of being bombarded by all the psychology stuff at once, Robbins splits it up between the stories of the case studies and uses what's going on in a certain person's life as a foundation for explaining all the whys and hows of the behavior exhibited by students and teachers. Switching off between students' stories and psychology/sociology explanation gave my brain a break, which I appreciated. Besides that, The Geeks Shall Inherit the Earth is simply interesting. This is a book about what is going on at our schools today, and some of it is simply horrifying. Teachers playing favorites and allowing "populars" to rule the school, teachers having cliques themselves, schools not celebrating accomplishments of academic teams, etc. Becoming aware of the problem is the first step, and these things really do need to change. On top of that, I felt a strong connection with all the people Robbins does case studies on, even though I'd never really had those same experiences. But, I think they just laid all their emotions out on the line, which made made me really feel for their situation. Robbins gives good advice for how to treat other people and how to make all students feel self-worth. If you work at a school, or if you're interested in why people act the way they do, definitely pick this book up. It's a great read. A generation of peace is about to be shattered as a seemingly unstoppable invasion force lays siege to High Prince Rohan's realm. For Andry, the Sunrunner Lord, the invasion is a fulfilment of his long-ago visions of disaster to come. This is the first book in the "Dragon Star" trilogy. I made the mistake of reading this even though I haven't finished the Dragon Prince trilogy. Due to that, there were some plot points of the previous trilogy that I'm sure were ruined, and I was thoroughly confused for the first 100 pages or so. It didn't help that those pages were also incredibly, incredibly slow. The family tree and character list at the end of the book really helped, and after the first 100 pages, I got the gist of who everyone was. As with most high fantasies, Stronghold takes some time to get going, but once it does, it's impossible to put down. My first love is high fantasy, and it's due to this incredible payoff that they give. It takes a lot of patience to get through the beginning, but the endings are always fantastic for all the setting-up that we have to deal with. This novel deals with a nation that has been spoiled with a couple decades of peace suddenly being overrun by "barbarian" invaders intent on taking them over. As with most books that deal with war, there's a huge struggle between Rohan, aged war veteran who goes for patience and not attacking until he has to, and Pol, his son who's desperate to prove himself as High Prince and warrior. Lots of violence, lots of death, but not gratuitous violence. It's not done for shock value, but rather for a realistic depiction of what war is. What I've always admired about Rawn is her ruthlessness to her characters. They're given tough choices and touch circumstances. It's not fluffy by any means, so they have a chance to really grow and change, which always makes for interesting reading. She also has no problem with spending ages and ages creating characters, giving them a history, background, family, etc., and then killing them off three books later. Again, it gives the feel of a war. For readers of the Dragon Prince trilogy, there are some hard deaths to take. It's really tough reading about these characters go from peaceful happiness to once again fighting a war. The ending is a bit of a cliffhanger, and I'm glad I have the second book at hand so I can see what's going to happen next. 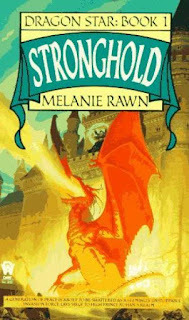 For fans of high fantasy, if you haven't yet come across Melanie Rawn, I would definitely suggest you give her a try. (Start with Dragon Prince, and don't go near her Ruins of Ambrai series. It's unfinished and will probably remain so.) For those who have already read the Dragon Prince trilogy, pick this one up. It's a definite must-read.